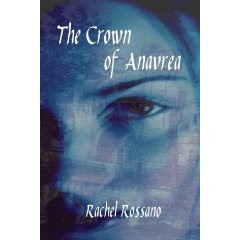 The moment I began reading, the Crown of Anavrea, I was hooked. The story begins with action and suspense, laced with danger and intrigue pulling the reader into the world of Labren and Eve, in the kingdom of Anavrea, a fantasy world where kings rule and slavery is legal. It is the story of Labren, a man on the run, hunted and badly injured when he is found by Eve, a slave from birth. Eve risks her life to care for Labren and saves his life. In return, he offers her freedom in the form of marriage. As they journey to his land, these two strangers who were thrown together by circumstance, must come to trust one another as their story is unveiled. Not much is revealed about Eve’s background and why she has been a slave from birth. Labren’s true identity is revealed and the reason he is a hunted man. There is so much promise in the first dozen pages that I had high expectations for this book. However, because this book is a novella, only 79 pages long, I felt I had just read a small part of a book. And I wanted to read more! Because the characters are interesting and the premise of the story good, I feel this book could have been expanded into a full-fledged 350-page novel, with the characters and plot more fully developed, as strong conflicts (expected from the reader because of the great beginning) were missing. As a result the danger, suspense and intrigue were short-lived. The enemy doesn’t turn out to be an enemy after all, and although reconciliation is an honourable end result, the struggle and journey to get there is what readers look forward to most. Nonetheless, despite my disappointment, I enjoyed reading this book. I liked the author's style and her voice. She wastes no time with flowery descriptions, but instead has a talent for painting a vivid picture through her characters and their interactions, making me sorely wish I had a few more hundred pages to read so I could be immersed in their world a little longer. Sounds like a fun quick read! I will look for it! This sounds like the kind of book I love to read! Thank you for the great review. I hope I have improved on my skills by my next release. :) Thank you. I haven't heard of this author before. The story sounds like something I would like so I'll check her out. Thanks for the review!